Athens, Texas is "The Home of the Original Hamburger." The Athens Visitor Initiative Program, in partnership with the Central Business Association and organizers of Uncle Fletch s Burger & BBQ Cook-off, commissioned Rick Vanderpool to create the definitive Texas hamburger poster. His unique collection of photos of over 350 Texas burger joints (gathered from 11,000 miles), should appease the visual appetite of lovers of hamburgers everywhere! 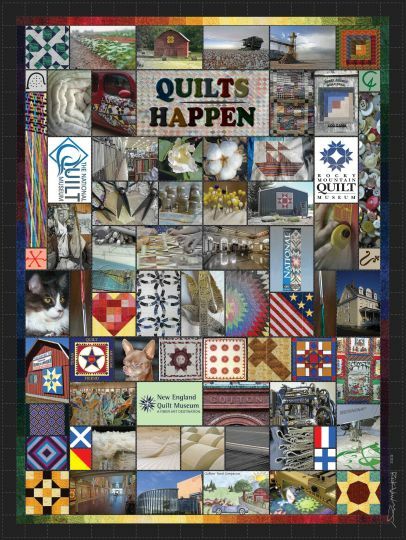 Quilts Happen is Rick Vanderpool's 32nd montage print. It celebrates cotton, sewing, quilts, and all aspects of quilt-making - most of the tools and "stuff" that go into the making of quilts – "from the field to fabric and finished quilt." Vanderpool has had a lifetime love for quilts, hearing stories that his father quilted with his great-grandmother as a boy. His father was born, Oliver Dean Statler, of the longarm quilting machine Statler family (the inventor of the Statler Stitcher, Paul Statler, is a fourth cousin). Vanderpool claims to have slept beneath quilts made by no fewer than three generations of women in his family. The montage contains mages from several high-profile collections around the country including the Texas Quilt Museum – LaGrange, TX; National Quilt Museum – Paducah, KY; International Quilt Study Center & Museum – Lincoln, NE; Rocky Mountain Quilt Museum – Golden, CO; The Quilters Hall of Fame – Marion, IN; and others. Quilts Happen's appeals to quilters and quilt fans everywhere. Dalhart, Texas is known as the headquarters for the fabled XIT Ranch – once the largest ranch under barbwire fence – 3 million acres, deeded by the state to the Capitol Syndicate of Chicago in exchange for building the Texas State Capitol in Austin (pictured in the lower right hand corner of the print). Copy compliments of the Texas State Travel Guide. 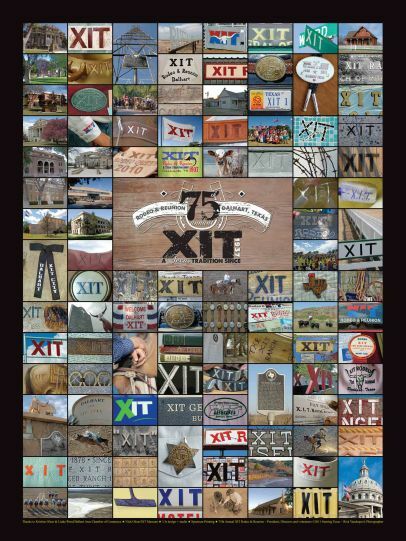 This print commemorates the 75th anniversary, in 2011, of the XIT Rodeo and Reunion that bills itself as the world's largest free barbecue – serving nearly 10,000 lbs. of beef in one evening. Learn more at www.xit-rodeo.com. Thanks to nearly 10,000 customers since 2001! This beautiful fine-art print includes photos of the state's name in a wide variety of sizes, shapes, colors, and materials. Printed on heavy gloss paper, this 19"x26" print is perfect for framing, and includes a legend identifying each photo's county. 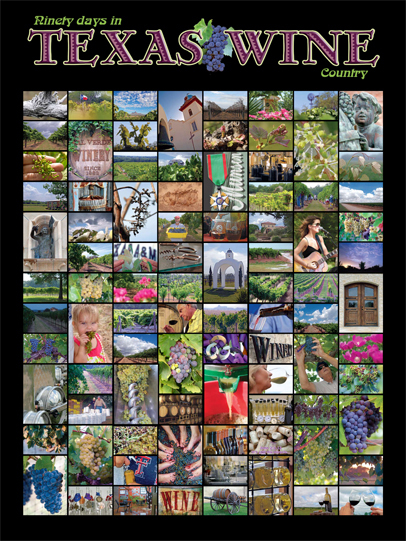 Looking For Texas is a statement of pride in Texas, and makes a wonderful gift for anyone who has lived in or visited "The Lone Star State"
Photographer/Writer, Rick Vanderpool recently spent "Ninety days in TEXAS WINE Country" – most of the grape growing and wine-producing season of 2009. "The photographer covered roughly 7,500 miles, but the writer traveled much further," says Vanderpool, of his experience to visit over 100 Texas vineyards and wineries. 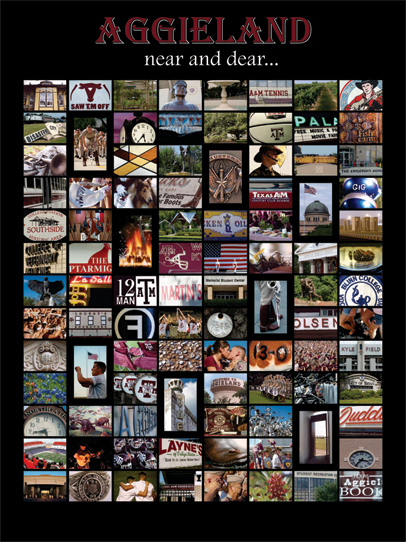 Commissioned by the Bryan-College Station Convention and Visitors Bureau, Killeen photographer Rick Vanderpool photographed nearly every Aggie icon and tradition, as well as legendary campus spots and off-campus joints and hangouts, near and dear to Aggie's of all eras. Sanderson "The Cactus Capital of Texas"
TexasEscapes.com notes: "Sanderson describes itself as an oasis between Del Rio and Alpine, with the most affordable housing, the lowest gasoline prices and cactus, cactus, cactus". 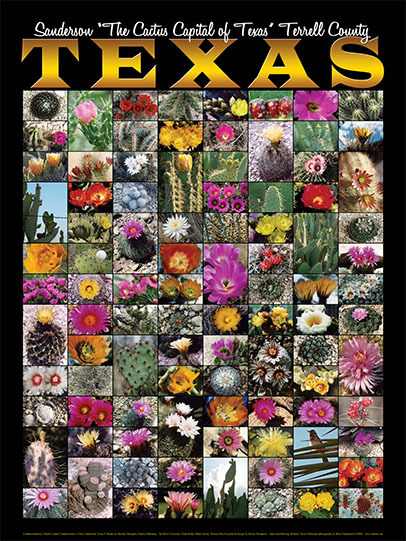 So many different varieties in fact, that enough thorns were put under a Texas legislator's saddle blanket to encourage the entire legislature, in 1999, to officially dub the community "The Cactus Capital of Texas." Your copy of this unique collection of succulents includes a key to the name of each lovely bloom or prickly pad. 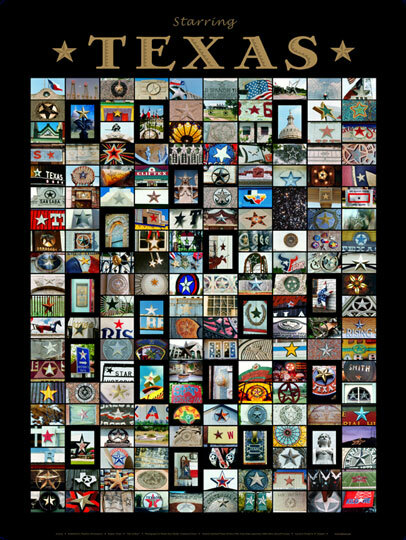 Rick Vanderpool, the founder of State Art and the main photographer, was commissioned by the Killeen Civic and Conference Center in the City of Killeen Texas to create a Graphic Time Capsule to commemorate the birthday of the Home of Fort Hood. The “Killeen” print pays homage to the largest military base in the free world on the event of Killeen, Texas' 125th Anniversary in 2007. 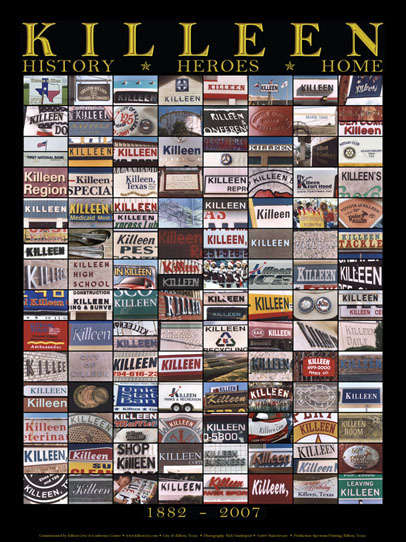 Among the 121 locations on this poster, you will images from every part of Killeen. The movie picture was once the object of our fascination. Marquee lights introduced us to palaces known as the Rialto, the American, and the Arlyne. These buildings represented a simpler time, a time when going to the movies was a right of passage from youth through adolescence to adulthood. The “Reel Texas” print pays homage to the moving picture palaces from all across the Lone Star State. 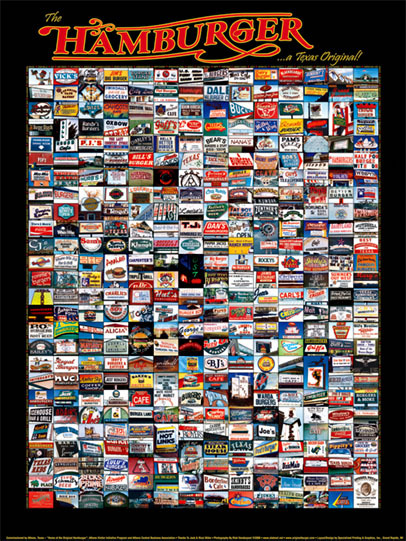 Among the 141 locations on this poster, you will probably recognize a few of these grand theater houses. 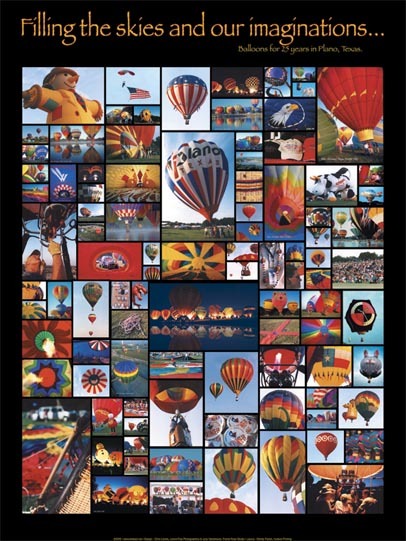 This beautiful fine-art print includes photos of the Plano Balloon Fest 2005. Printed on heavy gloss paper, this 18"x24" standard poster-sized print is perfect for framing, and includes a legend identifying each balloon. This beautiful fine-art print includes photos of over 100 Texas Windmills. 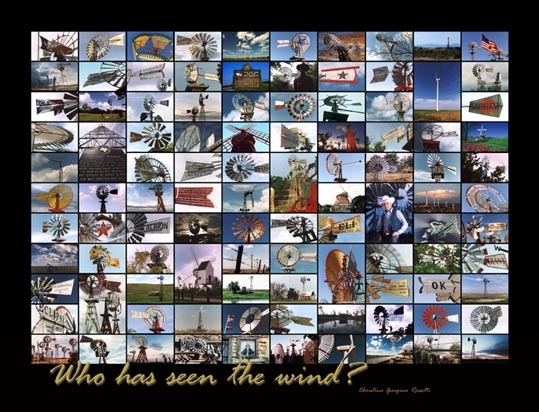 Printed on heavy gloss paper, this 18"x24" standard poster-sized print is perfect for framing, and includes a legend identifying each windmill. 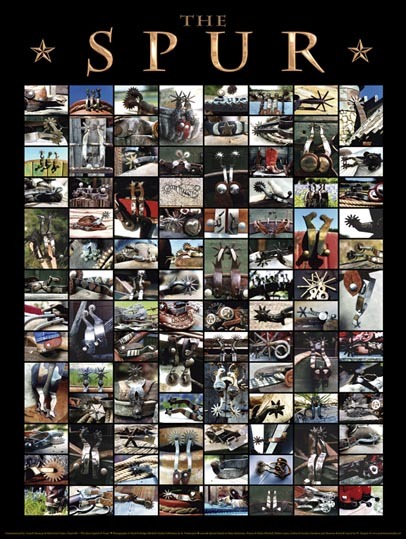 This beautiful fine-art print includes photos of over 100 Texas Spurs. Printed on heavy gloss paper, this 18"x24" standard poster-sized print is perfect for framing, and includes a legend identifying each spur. This beautiful fine-art print includes photos of over 130 Texas Wildflowers. Printed on heavy gloss paper, this 18"x24" standard poster-sized print is perfect for framing, and includes a legend identifying each flower. 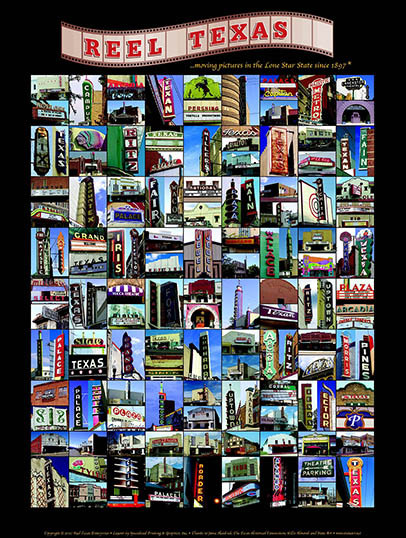 This beautiful fine-art print includes photos of something near and dear to Texan's hearts - Texas BBQ joints. Printed on heavy gloss paper, this 18"x24" standard poster-sized print is perfect for framing, and includes a legend identifying each BBQ photo.